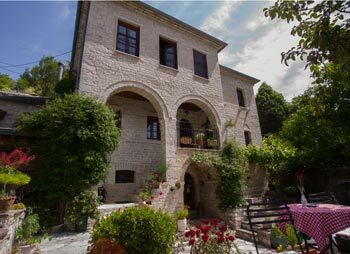 The imposing building of Casa Calda guesthouse rises in an idyllic setting. The mansion was built in 1864 by the merchant ancestors of the Bitsios family. The grand arches in the facade add plasticity and grace to the stone fort-like three-storey building, while a set of windows fills the internal with light. 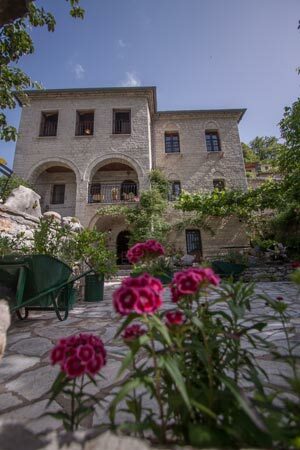 The patio of the guesthouse is paved with flagstones and extends in three levels, thus creating small private spaces, so that all visitors enjoy their privacy. These spaces are scattered, either in shady parts of the patio either in spaces with open horizon. Colourful flowers and fragrant basils in flowerpots, in the ground or in old large stone jars turned into pots by Mrs Popi (hostess of the guesthouse) are situated all around the patio. The ground floor is a beautiful space, decorated with old items of daily use and a fireplace, the ideal meeting place for the visitors of the guesthouse. This is where our lavish breakfast from high quality materials is served from early in the morning. Coffee, spoon sweets and of course our homemade tsipouro and snacks are offered to our guests throughout the day. On the first floor, where the "spitomana" (the room where the family was gathering) used to be, there are two large rooms with fireplaces and kitchens, 25-30 square metres, traditionally furnished that can host 3-4 persons each. On the second floor, where "ontas" (lofts) used to be, there are three rooms with large windows, comfortable, beautiful decoration and magnificent view to the peaks of Tzoumerka. The rooms are spacious enough to host two to five persons.